Beautiful chandelier, great quality for the price. Easy to install no assembly required. Bulbs included however bulbs are difficult to find. I hope the bulbs that came with the chandelier last forever. Freshly styled with a futuristic bent, this fabulous fixture is a focal addition to modern decor. 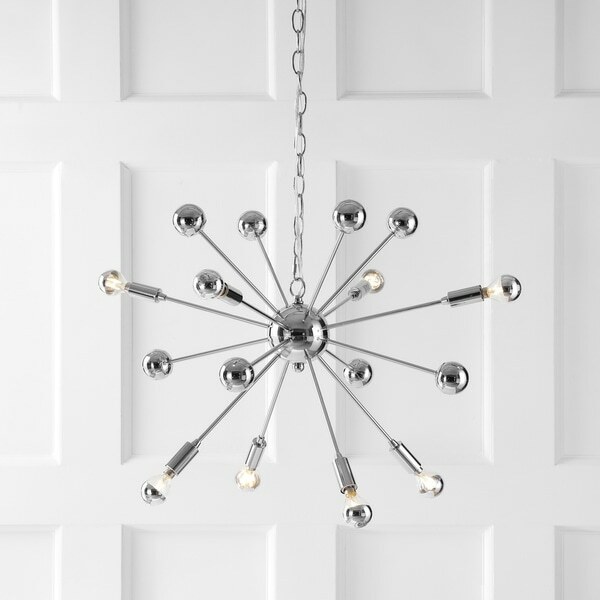 A bevy of bulbs jet out from an orb center, bringing a tantalizing effect in classic chrome finish. Amp up the drama factor in any contemporary space with this eight-light chandelier, which is LED compatible and therefore energy-efficient. Dimensions 22.5 In. X 22.5 In. X 87.5 In. This chandelier was a ice breaker! Great looking in the bonus room ! We love the lighting and modern space look that we got from this chandelier. I was surprised how large the chandelier was once it came out of the box but in our bonus area it was an appropriate fit. Like the clean streamline lighting it offered. This light is so beautiful. I have had an old fashion light inside my front door for 14 years. haven't found any lights that I wanted until this one. I wanted modern or contemporary and this is perfect. price was excellent as well. and I love it. If your looking for a contemporary chandelier that offers full, yet intimate lighting, this will serve you well. We were pleasantly surprised by its sleek look and easy of installation. The unit did arrive with a single broken bulb, but the seller promptly rectified the issue. Our dining room is 10'x12' and this light was perfect for the space. Beautiful product, everyone compliments me about it. Very satisfied with my purchase. It even comes witj special bulbs with chrome on the ends so it looks good with lights on or off. Great product. Esta muy bonito excelente calidad y se ve muy moderno y contemporaneo. Nice design, but not crazy about the chain to hang it. Not very heavy, so ease to hang anywhere. "Can it be installed on a sloped ceiling?" Yes, however we recommended hiring an electrician to assist you in doing this. "Does this come with the bulbs?" Yes, the bulbs are included. "Are the bulbs to this light fixture daylight bulbs or soft white? " "Wondering how bright this will be,will this bring enough lighting into a small dining room"
It is so different than a traditional chandelier! I can't wait to see it in person. "Is this light dimmable (using a dimmer switch)?"